In the Latter Day Saint movement, Kolob is a star or planet mentioned in the Book of Abraham as being nearest to the throne or residence of God. The literal existence and the exact nature of Kolob is a controversial topic in Latter Day Saint movement theology, as is the Book of Abraham, which has not been canonized by the Community of Christ and several other denominations. In an explanation of an Egyptian hypocephalus that was part of the Book of Abraham scrolls, Joseph Smith interpreted one set of hieroglyphics as representing Kolob, signifying the first creation nearest to the celestial or the residence of God. One day in Kolob is equal to a thousand years according to the measurement of this earth. Modern Egyptologists have made an analysis of the facsimile and with fragments of the papyrus from which the Book of Abraham was translated, and disagree with Joseph Smith’s interpretation. In response to criticism that Joseph Smith’s interpretation is not consistent with Egyptologists interpretation, some Mormon apologists promote a loose, symbolic interpretation of the facsimile they say is consistent with Smith’s translation. According to the literal interpretation, Kolob is an actual star in this universe that is near to, or perhaps the sun of, the physical throne of God. This interpretation has significant formative impact on Mormon belief and criticism, leading to conceptions such that the faithful will be made gods of planets in this universe, that God dwells within this universe rather than transcending it, and that the Biblical creation is a creation of the local earth, solar system, or galaxy, rather than the entire known physical reality. 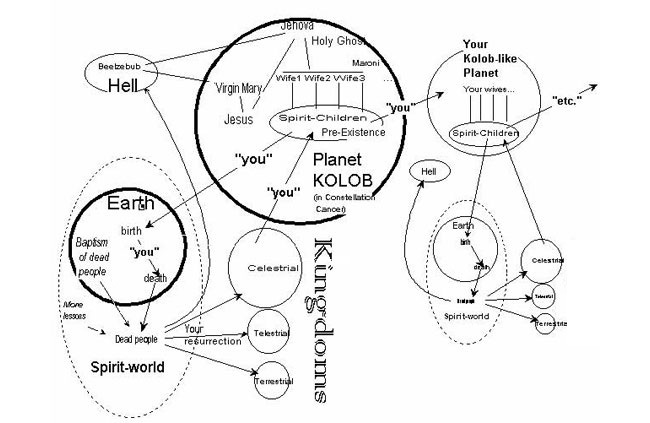 A metaphorical interpretation relatively uncommon in Mormonism suggests that Kolob represents Jesus Christ rather than a physical object and location in this universe. Advocates of the symbolic interpretation believe it harmonizes better with other Mormon beliefs and with beliefs in the greater Christian community, as it does not require that God have a physical throne within this universe. Kolob is similar to an Iroquoian word which expressed the power of life, healing, and rebirth, as symbolized by the rising of the Sun in the east each day. North American Tribes residing in the Eastern United States associated the rising of the sun with the direction of east, and associated Sunrise with divine power, rebirth, healing, and resurrection. The word kolob is similar to the Iroquoian word kalvg, pronounced kah-luh-g, which means east or Sunrise. The rising of the sun was associated with Asgaya Gigaei, the Red Man of the East, a pseudonym for the Apportioner or Creator Spirit, unelanvhi. Some of the elements of the two Battlestar Galactica science-fiction television shows seem to be derived from the Mormon beliefs of its creator and chief producer, Glen A. Larson. In both the original series from 1978, and the 2003 new series, the planet Kobol is the ancient and distant mother world of the entire human race and the planet where life began, and the Lords of Kobol are sacred figures to the human race. Kolob was also the name of a short-lived record label company founded by the Osmond Brothers in the 1970s. Released in association with MGM Records, the logo consisted of a hand holding a ball of clay resembling the planet. The Osmonds also recorded an album called The Plan which deals with themes in Mormonism related to Kolob.